I won the competition and named one of the Scotland players N Mitchell. don't buy the RWC 2011 game for xbox and ps3. the one to get is the jonah lomu rugy challenge game which is out soon! Mobile games are the cancer killing gaming. Amen, this is quite honestly better than RWC2011. Rugby challenge looks the way to go for sure. Wait four years and the lazy pricks spit out and almost identical game made worse by the fact that they couldn't license any decent teams or competitions! 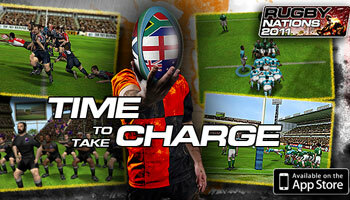 Rugby Challenge + Rugby World Cup 2011 are both poor for 360/PS3. At least Rugby Challenge lets you play as a club side (even if the squads are all wrong). Bugs galore, awful commentary, poor gameplay, weird AI, average visuals and neither have proper names for all players.